The thing I love most about baking is the memories that it evokes. This cake reminds me of years gone bye, when we used to get together every year at Christmas with Richard's family. So sadly we lost my most wonderful Mum-in-law, she was the matriarch of the family and the glue that held everyone together. Since her death we have all sort of gone our own ways. I know it is quite normal that, when you have a family of your own, families extend and children have their own children. They have partners so the group grows as do their family members and so you have your own family Christmases. But it was so nice when the boys were small, I really hope my boys will be the same with each other. All the cousins running around excitedly, Only Fools And Horse (or it's equivalent) on in the background with everybody cheating at the games and of course the TEA table. 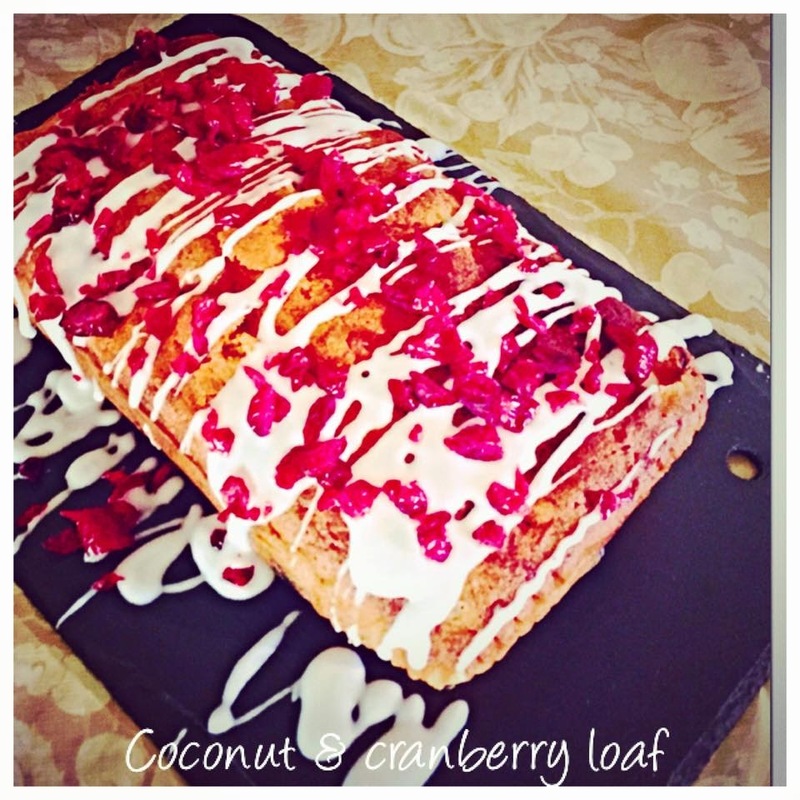 We'd all take our contribution, my sister-in-law is a fabulous cook (by trade) so the table would be laden with goodies and this is where the idea for my coconut & cranberry loaf came from. Sonias wasn't a loaf cake, I'm not even sure whether she used fresh cranberries, but I remember it being yummy. My other HUGE memory is a poem by Hillaire Belloc called Matilda, Kath (my Mum-in-law) would recite this every year after a couple of glasses of bubbly. She was the most amazing Mum and Nan and if I can be half the nan she was I will be very happy. We were all so fortunate to have had her in our lives. You will also need a 2lb loaf tin, greased and lined with baking parchment or a liner. Tip all of the cake ingredients, except for the cranberries, into the bowl of a free-standing machine and beat for 2 minutes until smooth. If you don’t have a free-standing machine, you can use an electric hand-held mixer. With a metal spoon fold in the frozen cranberries. Pour the cake batter into the prepared tin and spread level using a palette knife. Bake on the middle shelf of the preheated oven for about 50-60 minutes or until well risen, golden and when a skewer inserted into the middle of the cake comes out clean. You may need to cover with foil half way through the bake. Mix the icing sugar together with a little water or the juice of the lemon, to a thick paste. Drizzle over the cooled cake with the back of a spoon, sprinkle over the chopped cranberries.